Ah, the Royal Rumble. This is one of the events to get truly excited about... Most of the time. WWE has been in the doghouse for having two lackluster Royal Rumble winners, not once but TWO YEARS in a row. And for those of you who missed the hoopla, fans were NUCLEAR over Batista and Roman Reigns winning their respective Rumbles. Whether or not one approves of those men winning the rumble, fans did not like it. So there was an underlying pressure to generate someone the fans would get behind as Rumble winner. This year's Rumble was also noteworthy because the company decided to shake things up by putting the World Title on the line for the first time since 1992 (one of the best Royal Rumbles). This is a good move. As exciting as the Rumble can be, it has been a while since the company has truly mixed things up. Yeah, there was five years ago, when the Rumble was expanded to 40 - but that was just more people. And there was four years ago when they had the "anyone can enter rule", but that was just an excuse to add more joke candidates. With the internet, it's not exactly some big secret that before 1992, there was no prize for winning the rumble other than bragging rights. 1993 was the first time a title shot at Wrestlemania was on the line and the rest is history. Even if the Rumble winner didn't always make it (Steven Austin in 97 and understandably Mr. McMahon in 99), the idea was there so a serious mix-up may have been due. With this much pressure and a different kind of Rumble, was the event any good? This was the one match that I was absolutely looking forward to. Dean Ambrose and Kevin Owens are two of the best in the business right now so there was no surprise that they would put on a towering match. However, the Last Man Standing stipulation allowed them to put this one over the top. A common criticism of wrestling - even among people who are in the know (in fact, it's more among the people in the know because they actually watch the stuff) - that guys seem to just put rest holds on each other when they're supposed to be enemies. This match seemed like a legit fight! These two seemed like they were genuinely trying to hurt each other. There were some insane bumps - Ambrose being powerbomed through chairs, a top rope suplex where both men went through a table. These two just sold the idea that this match was a war. Both men played that they were exhausted but still carrying on out of willingness to destroy each other. After years of the IC title being an afterthought, it was impressive to see the title defended in a world title caliber-match. Ambrose won and retained the title after pushing Owens off the top rope into two tables, but both men should be proud of their work. This was a pretty solid tag match. The New Day had a hilarious promo before the match where they mourned the loss of their trombone. This match was nothing new, but it was everything done right - standard New Day chicanery with them keeping their tag belts in the end. Yeah, it was kind of a filler match with no new ground broken, but it was still a solid match that kept the flow going. This was a match I was less excited about. Both Kalisto and Del Rio are top notch performers, but they have also traded the US title on TV a few times by this point. So the expectation was not that the match would be bad - I just was not AS excited about this match. However, I was happy to be wrong. Del Rio and Kalisto have a unique chemistry with Del Rio's combination of technical prowess and brawling style and Kalisto's high flying style.The match also built some suspense with both men either evading or kicking out of each other's finishers. Kalisto won the red, white and blue gold. The company may be playing a little hot potato with the titles right now after months of long-lasting title reigns, that can be expected. Ugh, this match. In the past, I had been pretty cynical about the Divas' division. However, the hard work of ladies such as Sasha Banks, Bayley and two lovely ladies in this match has proven that women wrestlers can be more than just eye candy. They can have superb matches. This was not one of them. Now, to be fair, for their work, Charlotte and Becky Lynch did a good job. If it were just the two of them, this match would have been excellent. However, Ric Flair's participation brought this match down. There is a right way to portray Flair as his daughter's manager and having him cheat on her behalf. However, him randomly kissing Charlotte's opponents and throwing his coat at them turns matches like this into a joke. And for the record, both of those happened during this match. Flair kissing Becky might have been amusing if it happened with any burlesque... or purpose, but it was just some random thing that happened and made both people look worse for wear. The rest of the match was decent until the end where Lynch was distracted by the most lethal weapon of all - Ric Flair's coat. Charlotte won. This match just stung so much because after months of Divas finally having respectable matches, what should have been a good match was turned into a farce. Is all lost? The silver lining of this grey cloud is that Sasha Banks (who looked foxy with purple hair) came out. The Boss cleared house and certainly lived up to her nickname. Quite possibly the best thing about this Rumble is that fan favorites such as Dean Ambrose and Kevin Owens were treated like heroes. The fact is that wrestling, by nature, is a negative sum expansion. Someone has to win, and someone has to lose. However to quote "White Men Can't Jump", sometimes a win can look like a loss and a loss can look like a win. More damaging than who won was the fact that the people the fans wanted to see - Ziggler, Punk, Bryan were eliminated - if they even made it to the match - like chumps in 2014 and 2015. So it was refreshing to see guys like Jericho, Ambrose and Ziggler hang in there and look strong. - AJ Styles debuted during this match. It was awesome, he looked like a million bucks and the crowd was crazy for him. What else needs to be said? Okay, Styles looked good because he hung in there and was eliminated by Owens. The guy wasn't gonna win the world title in his first match so having someone the fans like throw out someone else the fans like was probably the best choice. - The Wyatts looked monstrous. For once instead of Big Show and Kane squashing everyone, they gave that role to people on the roster who still have some mileage in them. The Wyatts even knocked out safe pick Brock Lesnar. This is old school storytelling at its finest. Not only did these guys look like monsters, but they made those who survived their onslaught look good too. - On that note, because most of the match was carried by 5-star talent like Jericho and Styles, this was one of the more exciting Rumbles. There were no joke entrants either. Even though nobody expected Goldust or Erik Rowan to take it home, but they were at least plausible entrants to fill out a 30 man match. A joke entrant is okay every now and then, but when the world title are on the line, it's a positive that Jim Duggan and Michael Cole sat this out - especially when one considers that guys like Cena, Orton and Cesaro are injured. - This match centered around the top babyface entering at number 1, being ambushed by the heel stable, creating the illusion that he was eliminated, only to heroically return to battle, and then lose the Rumble to an authority figure. Yeah, this Rumble partied like it was 1999... widely considered one of... if not the worst Rumble ever. Granted, that Rumble was also bad because the ring was left empty several times, and most of the entrants were mid-carders at best. Also, Reigns was at least spared the embarrassment of being lured into two traps in one night. Jim Cornette once said that fan turnover is frequent enough that any idea can be repeated after enough time (whether or not that is still relevant in this day and age in debatable, but I still find it a good rule), but some ideas should be left alone. Also, if the bad guys bum rushed Reigns, why not LEGALLY ELIMINATE him? The Wyatt Family gets it! - Despite the lack of joke contenders, that didn't change them treating mainstays like jokes. why did monster Rusev spend such little time in the match? I guess the booking team isn't over that engagement. Wonder how long it'll be before Rusev gets some hip hop or ladies' man gimmick and starts jobbing on Superstars. R-Truth thought it was a ladder match. There's always room for a goofball babyface, but Truth isn't exactly Santino Marella (who MIGHT have made that joke work). Also, Triple H winning the Rumble - and thus the world championship - was kind of a sour note. His win isn't all bad - A good story was told with Ambrose just barely losing. The crowd inexplicably popped at this. I chalk Trips's positive reaction up to the fact that fan favorites WERE treated with respect this year. The company does also have a genuine heel champion, someone the fans would love to knock down. On the flip side, this practically goes without saying, but this reeks of Hunter stroking his ego. Him winning the rumble and the title just screams: "I run the company. Look what I can do." I missed the Reign of Terror so I don't have the hatred for the guy his reputation says I should. However, over the last five years, as he has fallen more into his backstage role and his ring work becoming fewer and further between, big wins like this become less justifiable. He doesn't even look the part without his long hair! If you don't believe me, consider that the announcers sold HHH less as a part-timer stroking his ego to steal the championship and describing him like some valiant fighter climbing the mountain to another world title run. All of this might be forgivable if it weren't for one teensy-weensy little detail. Folks, Triple H is (more than likely) going to headline Wrestlemania. To everyone who cheered him, let that sink in for a second. The biggest show of the year will be headlined by a past his prime part-timer who runs the company. So that was the Royal Rumble - Good? Bad? Well, there were problems, but this was an overall superb event. Owens vs. Ambrose practically makes this worth price of admission and the most of the undercard is still solid. 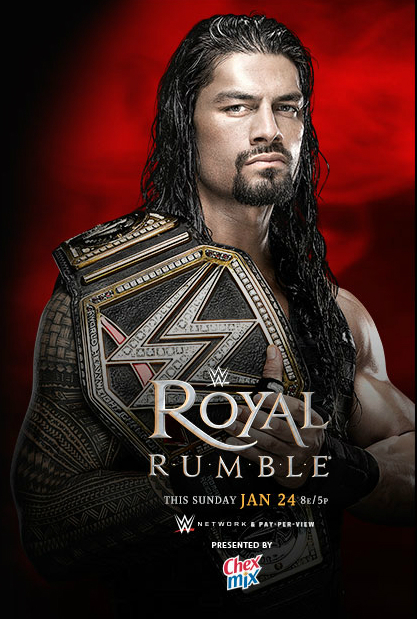 It is fair to expect a good Royal Rumble when it is not only the name of the event but takes up one-third of the card. While the Rumble Match itself was a little uneven, it was still the best Rumble in a long time - an oddly appropriate metaphor for the entire event. Every year it's the WWE's most hyped PPV. But is the showcase of the immortals all sizzle and no steak or did it live up to the hype? It's been moved from February to May, but WWE has brought back the Chamber. WWE presents two ladder matches and some good rematches in its annual event. WWE's biggest party of the summer proves to be one of the most anticipated events of the year. Is WWE's Attitude Era Overrated? WWE's Attitude Era is considered one of the most important eras of wrestling. But does it hold up? It's October and WWE goes to Hell. It's Tables. It's Ladders. And it's Chairs in one of WWE's wildest nights.